The philosophical foundation of Hinduism rests upon if not a questioning, at least an openness because we do not know who or what God is (Vedascriptions 1500 BC). This uncertainty offers us faith in who or what to believe, God, agnosticism and even atheism. The only one who can claim certainty is the one who has met God. If not it is only speculation. 2. Death was not then, nor was there aught immortal: no sign was there, the day’s and night’s divider. 3. Darkness there was: at first concealed in darkness this All was indiscriminate chaos. All that existed then was void and formless: by the great power of Warmth was born that Unit. 4. Thereafter rose Desire in the beginning, Desire, the primal seed and germ of Spirit. 5. Transversely was their severing line extended: what was above it then, and what below it? 6. Who verily knows and who can here declare it, whence it was born and whence comes this creation? A central expression of Hinduism is the sound “Om”, which stands for the Universal energy, transformation and transcendence all. In the early 2000s, I was interested in finding a group that studied phenomena of so called transpersonal and para psychological nature that I experienced but could not find an explanation for. In my diaries, I had so many examples that it was impossible to block, deny or intimidate them. My wife and my closest were tired of my skepticism and finally said that “The only one who doubts what you are experiencing and communicating is yourself.” Yes, I was the biggest skeptic and searched for evidence or contradictions to dismiss it all. For a period of time, as an excitatory journalist, I arranged meetings with those who were supposed to have the “gift” in the sense and purpose of revealing them. However, it did not work well and I had to realize that there was something that could not be explained by the logic of materialistic science. Then I received tips on a group of doctors and healthcare professionals who met regularly and in a sense to try and study such phenomena. It was a group of just over 25 people. I had decided to keep a low profile curious but also critically reviewing to observe and notice any fraudulent processes such as “cold reading”. The first thing that distracted was people who had strong need to exhale, their gifts and namedropping of other people they knew. Well, the only thing interesting at the moment is the ones here and what we are doing right now. I had left some previous groups for similar reasons, people who possibly have something or just believe so strongly and turn their own fantasies into reality. I thought “not now again” but decided to give the group a chance especially as it was a healthcare staff who drove it. “Man is so terrified of love that she resolves conflicts by killing each other”. Their motives for this study group were never discussed, but I have understood that many in the healthcare industry find that they can obtain information that helps them find the right diagnosis and treatment through inexplicable channels. Certainly you can refer to experience and intuition, but the mediation concerns something much more qualified. Possibly it is “channeling” but there might be other explanation to it. However, suggesting the possibility of para normal for such communication is not entirely risk-free. I would later discover a so-called “skeptics group” that seemed to be hard-knocked to kill both applicants and practitioners. Some of them organaized in anti humanist organizations. One of these anti-humanist leaders in Sweden have announced a price, “crystal”, to anyone prepared to provide evidence of such communication as clairvoyance or telepathy. Well, it’s on Wikipedia, so it’s “true”. I have challenged them but they have not accepted the challenge so, like another Canadian bluff maker, they do not assume challenges where they risk getting evidence of such communication that they deny. Before I discovered this pseudo-skepticism, it appeared that within families there may also be an intolerant and oppressive opposition. The doctor responsible for the group one day told that the might shut down this experiment. The doctor’s wife forced him to choose either to abandon his application or to divorce. Later I have discovered that this is no unusual reason for family conflicts. Another woman who has a great knowledge of the subject and whom I wanted to interview was forced to silence by her children in order not to risk the children abandoning their mother. Another mother of a brain researcher who had to detract not only from her own “gift” but by the son forced to stop hanging out with “friends” interested in studying the phenomenon. And interesting in this is how this mother has to find in turmoil statements to excuse her departure. In my research that follows “Grounded Theory,” I first collected my own experiences and then proceeded and searched for articles about others that may have had similar. Today, I can safely say that reports from doctors and researchers exceed what is required to validate the phenomena according to the scientific norm. But facts and evidence are not enough for the rigid and perhaps terrified denial. With me as a benchmark for this kind of denial, I can understand the problem. Even though, with my newly acquired insights, I find it sad. We are so much more than the mindset of the brain. At the same time, I am so happy and grateful to all the distinguished researchers I met in the search for explanations and one of them is the dermatologist Larry Dossey (pictured above) as I had a ten-year dialogue with many exciting issues that this arouses not least our ability to heal or be a channel for healing using only mind. This has also pushed a need for a new modern academy that takes advantage of the knowledge and inspires research and development. It has become even more important since the Swedish Royal Academy of Sciences in December 2017 has chosen the skeptic group’s overguru to chair, a brake pad against development and aggressive pursuer. The story of the young student who succeeds in deciding his professor with lack of logic is of course entertaining whether you are religious or atheist. Both should be referred to as believers. The only ones who can react with irritation should be New Atheists, ie those who KNOW that there is no God. But here comes the “tale” again. Entertaining rhetoric is it anyway. This diary got some attention during the TSC conference, not always appreciated. So the invitation from a scientific journal made me slightly surprised. The study presents practical contact with and observation of facts and events regarding extra sensory perception. The title is, of course, an allusion to Darwin’s classic book “On the Origin of Species.” Here we are concerned with the question of whether there is actually an origin of consciousness or if consciousness is eternal and its availability limited by physical senses. A car crash in 1987 opened my mind to the possibility of consciousness existing independent of the senses i.e. independent of the brain and body. The circumstances surrounding the accident involve a variety of extrasensory perceptions, which, up to that time, I had ignored because of my scepticism. The accident almost cost me my life and led to a long period of convalescence reflecting on what had happened. 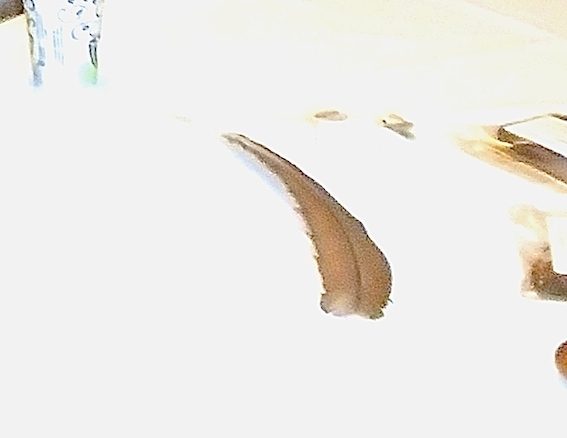 My documentation of the resultant experiences made it plausible for me to conclude that extrasensory sources of information were active even before the crash and also that these senses seemed to be boosted during the years that followed. In order to understand what had happened, I started to investigate my own experiences and then began to search to see if there were other people reporting similar experiences. It initiated what was to become research for more than twenty years. This really took off when the Internet and its search engines enabled data collection. The method based on Grounded Theory led to proto-scientific theories, published in book form in Swedish. In seeking the Existential Hub I suggest that there might be a consciousness connecting Body (Emotion), Brain (Logic) and Psyche (Spirit) i.e. the theory of three different minds, all inter-linked. The first is the body consciousness that originates within the body. We all sense when the body “tells” us how it feels, what it lacks and what it wants. Then there is the brain consciousness. This is dependent on the “health” of the brain; in dementia we lose memory and the ability to deal with the simplest tasks. The interaction of mental trust and emotional self-confidence can cause the body to increase its performance, while negative stress can prevent the functioning of both brain and body. A strong impression retained in the consciousness will be experienced emotionally and will usually result in physical expression and reaction. To support the hypothesis of body an emotional driven consciousness and the significance of the heart there are a number of studies of heart transplants; these testify that people can undergo fundamental changes of personality and suddenly acquire new interests and tastes. These changes can be traced back to the donor. The search for an existential hub does not end with the emotional “heart-brain” connection. Reports suggest that the mind also has its own external level, existing and functioning outside both the body and the brain. I call it the “independent consciousness.” Former Research Director Dr. Larry Dossey calls it “non-local.” This is also the subject of The AWARE Study by Dr. Sam Parnia. During a meeting with Prof. Peter Fenwick in Stockholm in 2015, he confirmed that neither of the doctors had had a near-death experience. This might explain why the scientific approach, as has been noticed, was not working. Those who have had a NDE are aware that interest is focused on one’s own body and the people linked to it; non-relevant items, like pictures on a shelf, are of no interest. There are some studies claiming to relate to NDEs but which actually deal with other issues, such as the dying process. A study of rats by Dr. Jimo Borjigin, University of Michigan, was reported as “New discovery teaches us about near-death experiences” and this received some attention in the media. However, this study actually tells us nothing about NDEs! This study provides only technical information about electrical changes in the brain at the moment of death of some rats. Though this is a controversial subject among scientists, it should be handled with respect and sensitivity. To say that all NDEs are the results of chemical processes in the brain is patently incorrect. A person [wrongley?] 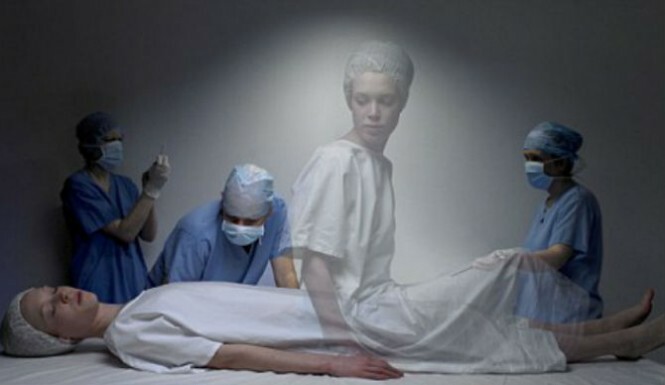 declared “clinically brain-dead,” lying on an operating table, cannot have an overview and be able to follow discussions, or even follow people leaving the room, as has been related by those who have returned after NDEs. It is essential, therefore, to consider NDE research at an appropriate scientific level; this will instigate discussion of the phenomena and results in order to fully take advantage of such experiences and allow rational consideration. In the book, Twelve Senses I present three different consciousnesses which all within themselves can have different dimensions. The first is a body consciousness that originate in the body. With evolution, we got a brain and consequently a brain consciousness . These two consciousnesses should not be particularly controversial. We can all feel that the body “tells” how it feels, what it lacks and when it becomes too much. Stomach rumbling when we are hungry and we get sore when new muscles activated. The body reacts to fear by whiten and neck hairs stand up. Brain Consciousness is dependent on brain fitness and in dementia or concussion we can lose memory and the ability to cope with simple tasks of everyday life. We can also see the interaction between the brain and body consciousnesses. Mental trust and emotional self-confidence can get the body to increase its performance while intoxication can knock out both brain and body. 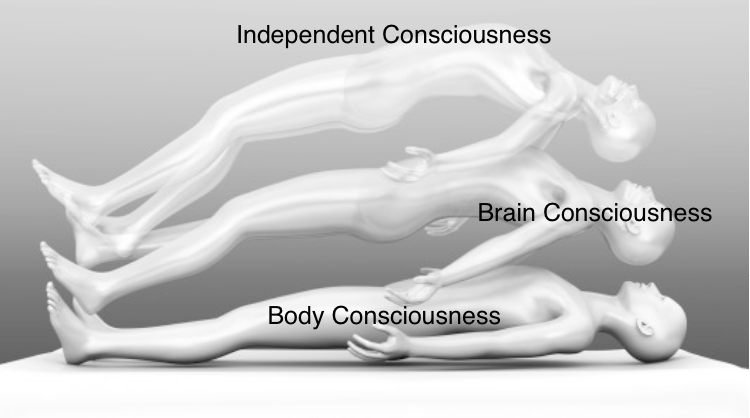 How should we define consciousness? Yes, science has ended up in more or less animated discussions and to contend with both hard and soft problems. I find no sense in me intermarry with those not leading to any real explanation. We have senses that perceive the condition which conveys the impression. We may experiencing these as sensations in the body and as emotions and balances or imbalances and we can then interpret those impressions using the brain’s thoughts. Nervous system that connects the brain with the body goes through the spinal cord and the so-called reptilian brain up into the cognitive system in which we can name and understand impressions. As long as a strong impression is retained in the body it will be experienced emotional and it will mostly result in physical expressions and reactions. Center of the body consciousness in the heart? If the existential hub has its physical center of the body consciousness in the heart this might also be both the core sense and the brain of the body. A theory that is strong in other cultures such as in Africa and muslime world. Body Consciousness carries the experience from the heart through the spinal cord to the brain and mediates various needs that brain consciousness will handle and decide. To support a hypothesis of heart significance are studies of a large number of heart transplants who testify that people can undergo fundamental change of personality and suddenly get new interests and changing tastes. Such interests and tastes that they can then relate back to the donor. (Twelve Senses 2012 page 100, Twelve Senses 2015 pp 97-98). But this existential hub does not end there. I have found that the mind has an entirely own level and it is outside the body and outside the brain. I call it “independent mind.” Medicine Dr. and the former Research Director Larry Dossey calls it “Non-local”. 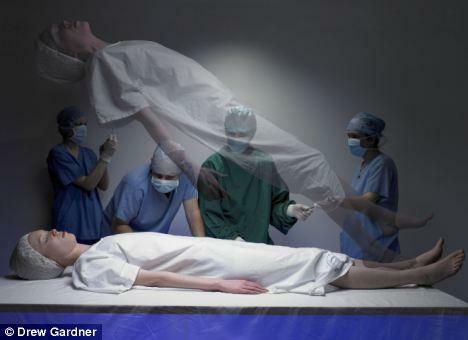 This independent consciousness becomes apparent at out-of-body experiences (OBE) and Near Death Experiences (NDE), especially when the brain has been declared clinically dead or in a coma. From such conditions, people who have returned to life may tell the most outstanding impression, even how doctors and nurses have acted during a patient’s “unconsciousness” or death. But the person have not been “unconscious”, the brain has been turned off, the brain consciousness has not worked, however another much sharper “independent consciousness” has been present. The question is how the independently consciousness interact with the body and the brain? Is there an existential hub? 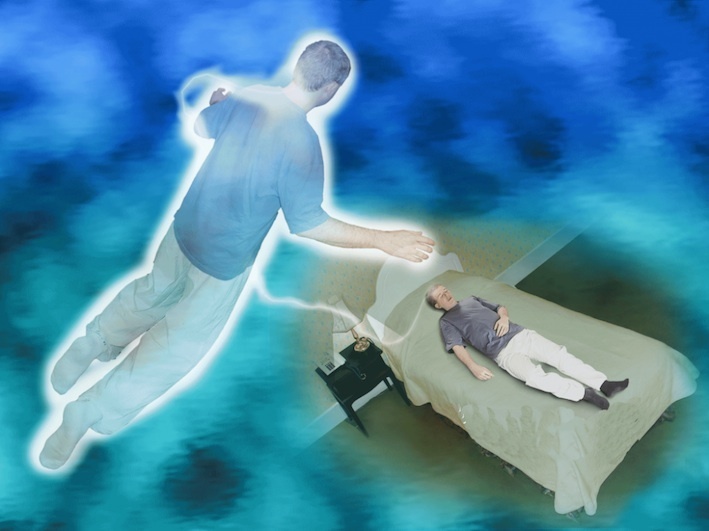 The independent consciousness may capture images of its “dead” body and the thoughts and feelings of this body, even if it is on the other side, in the so called spirit world. That means a consciousness that we can not yet explain or understand with the laws of nature that science today allows describing and drawing the boundaries of reality. My only explanation for an independent consciousness is a mind-body or a soul. And then it is probably always present. That could explain the ability to morality and to love and their differences. These features of the soul may be unconditional and nonjudgmental. While body and brain conditions them for its survival. There are many stories about and with young children that can be indications and also provide evidence of reincarnation. Here I present three such stories. The first is from a documentary “The Boy Who Lived Before”, the second is a boy who tells how he died as a combat pilot during World War II and the third story is another little white boy who says he died as a black woman jumping from fire. Cameron, ever since he was just a toddler, talks about another family he used to live with, called the Robertsons. Cameron knows the names of his previous family, where they lived, and can even describe the house and the landscape of his previous home on the island of Barra, some 200 miles away. But Cameron has never been there. Doctor Jim Tucker, of the University of Virginia, and Cameron’s mother travel to Barra with Cameron to find the house, exactly as Cameron described. This six-year-old boy is called Cameron Macaulay. He is not much different from other boys of his age. What differentiates him from others is that he likes to talk about his “old mum”, his former family and a white house standing on the bay. But none of them is related to his current life. The place he is talking about is a place where he had never been in this life and is on the Isle of Barra, 160 miles away from where he is living now. These things make Cameron’s mother feel worried. Cameron spoke about his former parents, how his dad died, and about his brothers and sisters in the previous life. He also said that his “old mum” was the one in his previous life. Cameron believes that he has a previous life and he worries that the family in his previous life misses him. His nursery school teacher told Norma all the things Cameron was saying about the Isle of Barra and how he misses his mummy and his brothers and sisters there. COMMENT: This story catches my emotions and reminds me of how I as a little boy allways run to hide when I heard an aeroplane. I was 6 or 7 and this was around 1956, eleven years after the second worldwar. I was born and lived in Sweden who had no war what so ever. I made the same sketches as this boy, and was always frightened for bombs. When I grew up and at this time we did not even have a TV at home and personal computers or mobiles were not available. So I couldn’t have got the pictures from the surrounding environment. 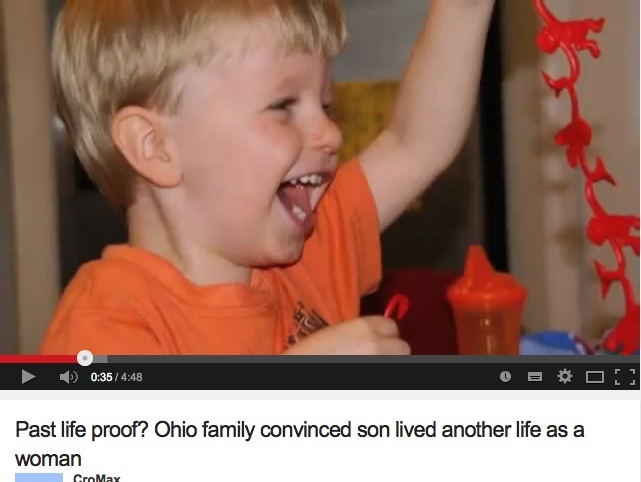 CINCINNATI (WITI) — Parents will tell you — kids say and do the darndest things. “We used to laugh and call him an old man,” Erika Ruehlman said. Ruehlman says she found it quirky and cute that her young son, Luke seemed obsessed with safety in and around their suburban Cincinnati home. “Very cautious about, like, crossing the street — anything that might be hot or dangerous or high,” Ruehlman said. And then there was that other fixation. “I think I specifically asked him ‘why did you name your ladybug Pam?’ And he said ‘I just think it’s a nice name,’” Ruehlman said. Soon, everything was ‘Pam,’ with increasingly peculiar comments. “He used to say ‘when I was a girl, I had black hair,’ or he would say ‘I used to have earrings like that when I was a girl,’” Ruehlman said. The stay-at-home mom wondered “where was he getting these ideas?” Luke’s answer changed their lives. “I was like ‘who is Pam’ out of frustration, and that’s when he turned to me and looked at me and said ‘well, I was.’ And I was like ‘what do you mean you were?’ And he’s like ‘well, I used to be, but I died. I went up to heaven, and I saw God, and he pushed me back down and when I woke up, I was a baby and you named me Luke,’” Ruehlman said. Now, Ruehlman was really confused. “She called me and she said, ‘you know, something weird is going on,’” Ruehlman’s mom, Lisa Trump said. “We started to realize that perhaps we did actually have something there,” Trump said. “I decided to go ahead and ask him further — ‘do you remember how you died?’ And he looked right at me, and he said ‘well, yeah. It was a fire.’ And then he made like, a motion with his hand. Like he was jumping off of a building,” Ruehlman said. A tall building, in a big city — where Luke said he walked a lot, and took the train. “I was like ‘are you sure it was Chicago?’ And he was like ‘yes, I remember it was Chicago. It was Chicago,’” Ruehlman said. Ruehlman plugged the information into the internet. “And that’s when I came across the Paxton Hotel,” Ruehlman said. The Paxton Hotel was a residential building in a predominantly African-American Chicago neighborhood. “You know, I just asked him — I was very casual about it, like — ‘Luke, what color was Pam’s skin?’ And he just looked right up at me like – ‘duh, black,’” Ruehlman said. In March 1993, a massive fire raced through the Paxton Hotel, trapping most residents. Nineteen people died — including a woman in her 30s named Pamela Robinson. “Pam had jumped out of a window to her death. I was really kind of weirded out by it at this point,” Ruehlman said. While working with the Lifetime documentary series “Ghost Inside My Child,” Erika and Nick Ruehlman decided to put their now five-year-old to the test. “I printed out a picture of Pam, and we had put it on a sheet of paper with a bunch of fake pictures. I didn’t really think that he was going to pick the right one,” Ruehlman said. “And he pointed to the correct one,” Ruehlman said. “It took me a couple days to wrap my head around it. I couldn’t sleep. 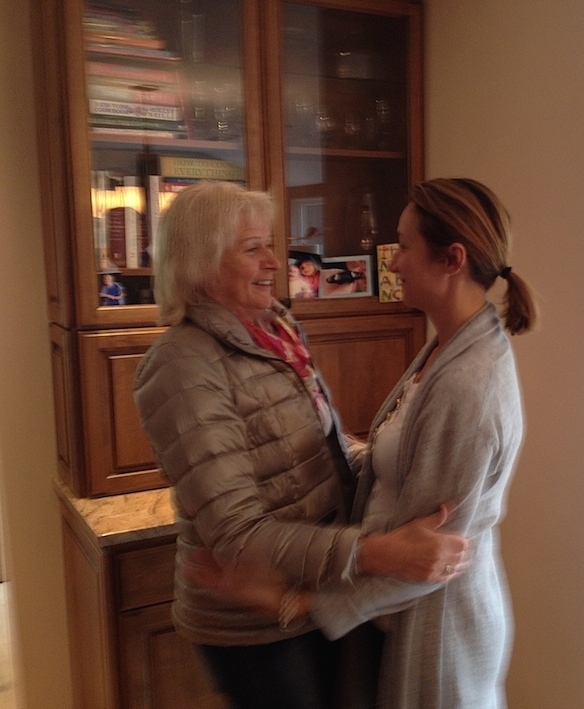 I thought about it constantly,” Ruehlman’s mother, Lisa Trump said. The Ruehlman family says immediately, their thoughts turned to the family of Pamela Robinson — still in the Chicago area. FOX6’s sister station, FOX8 in Cleveland reached out to them. They said “no comment” at this time. Erika Ruehlman says she spoke with a family member of Pamela Robinson, and she discovered even more similarities. “I know that Pam was a big Stevie Wonder fan, and Luke really likes that era of music. She played the keyboard a lot, and one of the things that Luke — his favorite toy at the time was this little tiny piano that he would tote around with him,” Ruehlman said. Just as Ruehlman was becoming truly connected with Pam’s memory, Luke let her go. “It’s like he got it all out and he was finished — and he had nothing more to say about it,” Ruehlman said. But the family continues to share their journey with anyone who will listen — not seeking fame or fortune. “We didn’t receive any money from the (Ghost Inside My Child) show,” Lisa Trump said. They tell Luke’s story because, they say, it’s a message that needs to be told. “It’s a positive one. It’s one of unification. It’s one of love,” Erika Ruehlman said. “I think it tells us that we shouldn’t define the soul by race or gender. Out of the mouth of babes,” Lisa Trump said. When I woke up it was natural to try to recreate the music and so I started playing the piano again after, it felt like decades in which the instrument stood and gathered dust. I also bought later a new synth that gave opportunities to play different instruments from a keyboard. But at this moment I got help from Mikael Lindfors who produced my music. I could on his synth create any instrument such as the flute, violin and even drums. And so we made The CD Record Ohma. I am eternally grateful to Mikael Lindfors who supported and helped me succeed with this realization. I sometimes came to him with music recorded on a dictaphone and could then with all the possibilities of his synth try to recreate the vision. At some point, he “translated” my idea and showed me how it could sound. Over some months work with my music we got into a special interplay. In late January 2015 my friend Peder Wistedt sends me a link and an article about a man, Tony Cicoria, who has a history reminiscent of mine. I was not hit by a lightning bolt but a car crash and my visions of the music came much later after the accident so the connection is not as obvious. In my case, there may be other factors also reconcidered. My history of near-death experiences seems also different. These states of consciousness, I have studied and sought explanations for in a 20 years rseearch presented in the book The Twelve Senses (Translation in English takes time). A chapter Different States of Consciousness describes artistic expression. I hereby convey the story of Tony Cicoria in an article by Oliver Sacks ‘Musicophilia’ Published: October 28, 2007. Tony Cicoria was forty-two, very fit and robust, a former college football player who had become a well-regarded orthopedic surgeon in a small city in upstate New York. He was at a lakeside pavilion for a family gathering one fall afternoon. It was pleasant and breezy, but he noticed a few storm clouds in the distance; it looked like rain. Excerpted from Musicophilia by Oliver Sacks Copyright © 2007 by Oliver Sacks. 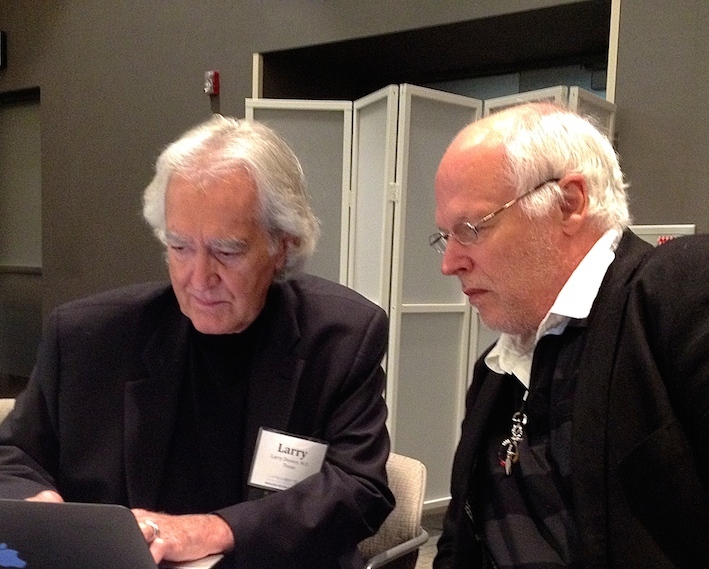 In the autumn of 2014, we visited Grand Rapids in the US to meet with author and researcher Larry Dossey. I had met John and Amanda Wheeler six months earlier at the Tucson Airport. If I ever were to visit Grand Rapids, they wanted to assist me with guidance and be my host. Such promises made by people you meet once will not so often be realized. However, came various synchronous events to realize the reunion. After a week of Outstanding generosity and deeper friendship with the family Wheeler and what I must confess an affection and a flow of brilliant nature, we would then meet Larry Dossey at the conference Universal Health Solutions . Ritva and I had met Larry and he had now gone off to prepare for his speech. So glides Wheelers in with a friend / relative to Amanda. We sat at a table at the front. Conference management was prepared to John and Amanda would come and showed them to our table. When John came, he put down a long eagle feather in front of me. The gesture itself was presented as a gift that I could not refuse. “I tell the story of it the later”, John said . After the conference, we were invited to a farewell party at Wheelers in their own pub. It was a barbeque on a deer John had shot with bow and arrow. A hunting method that is sacred among indigenous and only Native Americans who have a legal right to this hunting in the United States. John told the story of an eagle feather, he showed us the Tippie (teepee) he had built on the plot and in which Amanda had giving birth to their children. According to tradition, women gather around the woman in labor to help and protect her. When we came into the saloon and had sat down, John told the story of the fether. To get an eagle feather in this way that John received it, as a gift from the eagle, is considered especially significant and magical. I now had been given it, with the background of such a story, it felt even more surreal and overwhelming. How can you give away such a fether? The trip to Grand Rapids / Michigan United States had been initiated by an invitation from Dr. Larry Dossey, American scientist and author who I have come to admire. Larry Dossey, is one of the most prominent when it comes to formulating and displaying explanations of all the phenomena we have around the creative force of intentions and thoughts, transpersonal experiences (paranormal and supernatural) and he has in interviews about the soul and the afterlife demonstrated a deep spiritual wisdom and competence. Link interview with Larry Dossey. Link The Book One Mind. Prior to the invitation, we had for maybe 18 months, a fairly frequent exchange of theories and ideas initiated by Professor Adrian Parker (University of Gothenburg) that inspired Larry to contact me. For that I am eternally grateful to Adrian. This invitation was synchronous with that John and Amanda Wheeler imparted at Tucson Airport six months earlier. When my dear Ritva wanted to join was no turning back. Five amazing days directed by John would now end with the meeting with Larry. John and Amanda had moved their departure (for holidays) from Saturday to Sunday and they also wanted to meet Larry. I announced the conference line that we could be four five people who came there as Larry’s guests. 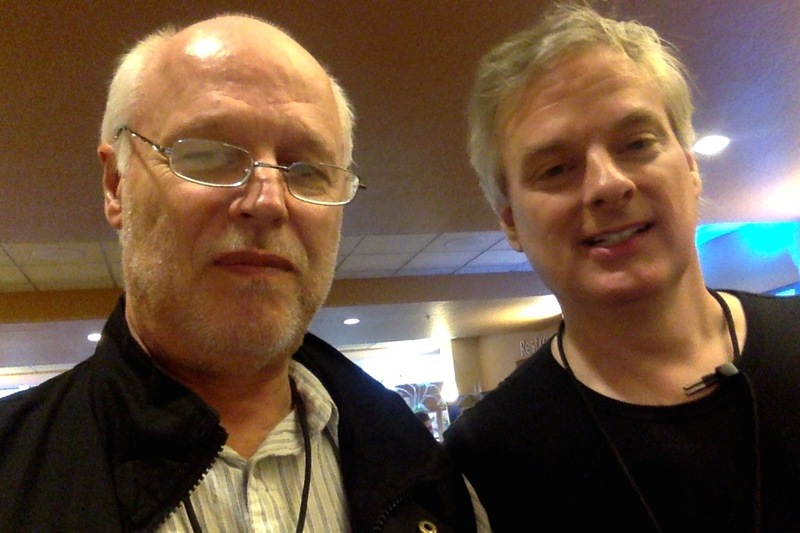 Ritva and I could meet Larry and have almost an hour meeting with him before the conference started. John and Amanda came shortly before the keynote address. 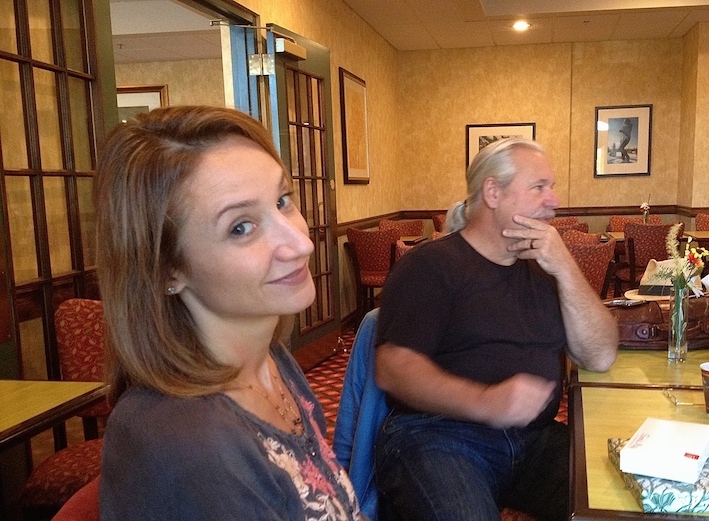 I could see them in the corner of my eye while a long eagle feather tumbled down on the table in front of me. “I tell the story of it the later” John said. The gift was for me already outstanding, it would prove to be even more outstanding with the story behind it. 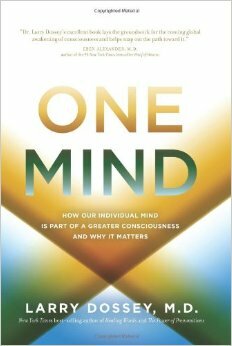 I could also rejoice that John and I were presented with a copy of One Mind with dedication. John then also got an opportunity for a half-hour conversation with Larry. The contents of Larry Dosseys presentation co-tuned well with the philosophy Two Dogs presented and that meant a deepening and an understanding of some of the North American peoples spiritual approach. When we got back to Sweden and I had melted experiences flowed impressions and thoughts and then also through dreams spectacular new vision. 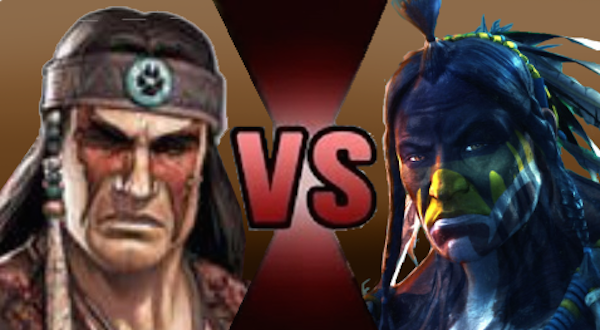 It was close the state I experienced after meeting with Miq Maq Indians in Canada in 1996. Some about these experiences also get a separate article later. Friday morning a chilly dawn with clear skies and fall colors. John picks us up outside the hotel and we go to their home to enjoy breakfast that Amanda has prepared. It was of course again a culinary highlight. That Bacon could taste so crunchy and delicious. John lends us a big jeep and soon we sit on the highway heading north to meet Two Dogs again. John has in his generosity created a flow that now gives us another day with Two Dogs. This day proves to give us deeper experiences of Ojibwe/Chippewa traditions, stories of people’s life, some facts about the rituals, and of course discussions about spiritual approach. We are very grateful to have been offered this opportunity that turns out to be in a way also transformative. See explanation here. Glad that promise could be fulfilled so easily. When we walk around with Two Dogs also the conversation shift between the spiritual world, rituals, the local tribe’s history and people and Two Dogs personal experience of this. These deep conversations describes a philosophy that recognizes and includes all people. We are all family and we need to learn to show love and pay respect to everyone, even our enemies. That’s the hard part. We also need to practice to show gratitude. “If you think about it there is much to be thankful for” , says Two Dogs. So he tells of the daily ritual of sacrifice and gratitude to the earth, sun, water and air, and I think of Lisbet Gemzells music-set tale of the four elements which she recorded in 2014. There are a lot of synchronicity going on here. My sense is that we are already part of the family and in just two days, we came very close. I had the day before asked for a new name and I am curious if Two Dogs has got something. He mentions “Red Bird” but says that it need not be the final name. In the past you could discuss this long before it was closed, he says. Two Dogs has prepared rituals with drum and rattle. He gives us a performance of how these are being used. He also shows the sacred pipe, and what kind of clothing and jewelry that may be suitable for rituals. Out in the garden is a circular ritual site. It is built of wooden poles. Slightly off center lies a stone. The thirteenth symbolizes the one who ended up outside but at arms length and welcome back into the community. We made no rituals so I can not tell you how this particular location was used. At the sweat lodge was a buffalo skull. Here Ritva and Two Dogs compared Finnish sauna ritual with sweat hut. Two Dogs also told that it was regarded almost as a betrayal to reveal the rituals for white men. We do not ask him for anything but letting his initiative to control the day. Declines the sweat lodge as it does not feel like it is time for it this time. We want to go home before dark and we can not this day stay over as Two Dogs welcomes us to do. The next morning we will meet Larry Dossey and that meeting can not be jeopardized. Before we end the day Two Dogs tells us about chiefs and relatives called “Grandpa”. Grandpa Joe Madako was the youngest child of nine, and his mother died in childbirth. This resulted in that the children were placed with relatives and where Joe was passed around. During World War II, he was a very lonely and angry teenager who enlisted when the US entered the war. He came home from World War II with many medals. Two Dogs said that he took out their anger against the enemy, and it was a shame about the Germans who met him. Joe Madako was later also as highly esteemed “Oqichida” – and the spiritual warrior an amulet, a medicine wheel that since Two Dogs inherited. Two Dogs also told the myth of Windigos-Thunder Beings, some evil and some good. Right now there is a final battle between them, the materialistic that becomes hungrier the more they get challenged by those who are driven by love. “Love’s fire will destroy the material world” . Before we would leave Two Dogs put a very beautiful arrowhead of flint in Ritvas hand. 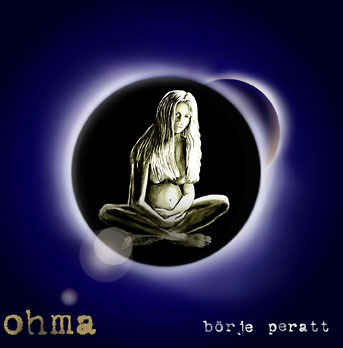 Ritva then said: “Now Borje will be envious.” The next moment I had Joe Madakos amullet in my hand. Humanism accepts you and whatever path you follow as long as you also accept and respect what ever belief and way of life other choose. 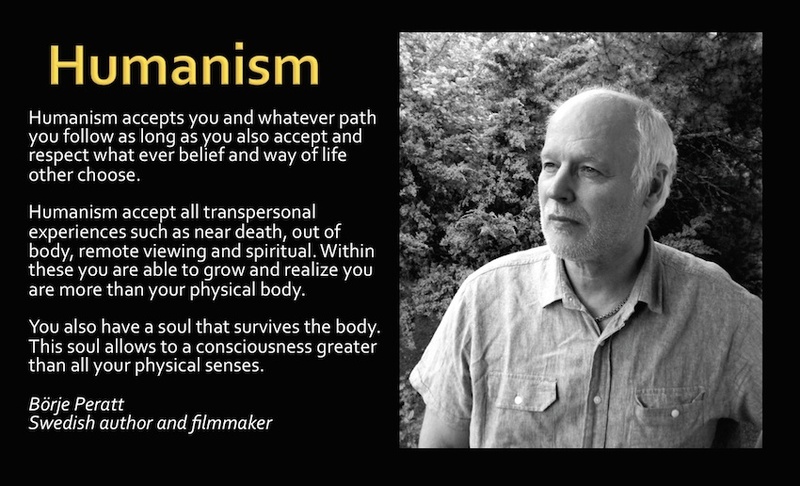 Humanism accept all transpersonal experiences such as near death, out of body, remote viewing and spiritual. Within these you are able to grow and realize you are more than your physical body. You also have a soul that survives the body. This soul allows to a consciousness greater than all your physical senses. 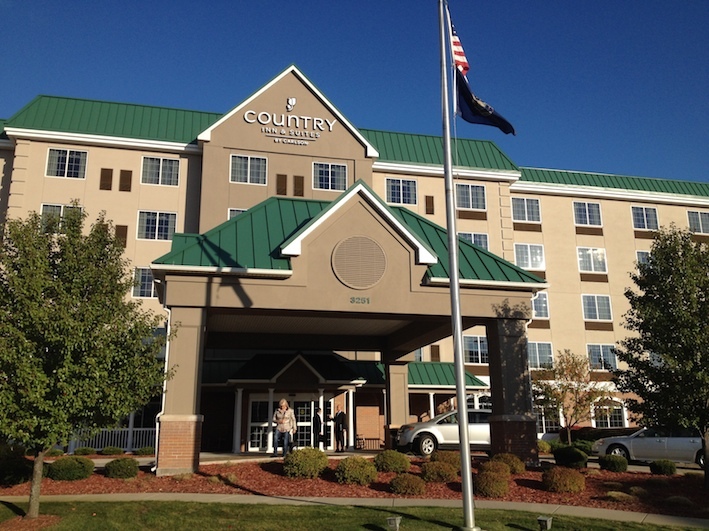 Grand Rapids October 23, 2014 travel logbook day 4. John picked us up Thursday morning 23 October. The fog was dense, it had been a frosty night so a special shimmer lights up the ground and trees. First, we did a stop at John´s son Ryan in his hunting & sporting store. We then stopped at a store next to the road to prepare for the visit by, among other things, buying tobacco. It turned out to be not for smoking but for various ceremonial sacred rituals. Two Dogs and his wife Karen greet us with open heart. He asks me what we want from the visit and I ask him to give me a new name. We enter the house and I hands him the tobacco package. He takes it but is somewhat embarrassed and says – “now I have to give you something.” I answer then – “I have already requested it.” He remembers my wish for a name and accept the gift. The contact between Ritva, Two Dogs, Karen, the little dog Lilly becomes immediate positive. After a little while he takes me on a tour in the house. I have the same night had a dream of Two Dogs and seen an owl. Now I see among all the paintings from friends, relatives and animals a painting of an owl. So I ask Two Dogs what owl means to him. He replies that it is his totem. Later I learned that this totem is in contact with the underworld or the other side. On a coffee table is a book by Kübler Ross and without saying it straight out, I understand that Two Dogs had experiences from the other side. Not sure if it’s NDE or through meditation or other exercises but I do not examine this more closely. Two Dogs want us to stay and sleep over but we are not prepared and we decide to return the next morning. Two Dogs takes us out to see the sweat hut behind the house in the woods. On the way, I again hear within me “Molly – welcome”. I ask Two Dogs who Molly is. He answers, “My younger sister”. I wonder why she welcomes us to the Two Dogs lodge. He then get a fast congestion in the throat and apologizes, explaining that she is dead and is spread out in the garden on a memorial circle just before the sweat lodge. He tells us nothing about how she died, but it was long ago and I understand that she died quite young. On the way back to the cabin something urged me to almost run into the woods. There on the ground grows a little flower stalk with three perfectly healthy flowers. A stem that this time of year survived frost and should have wilted. 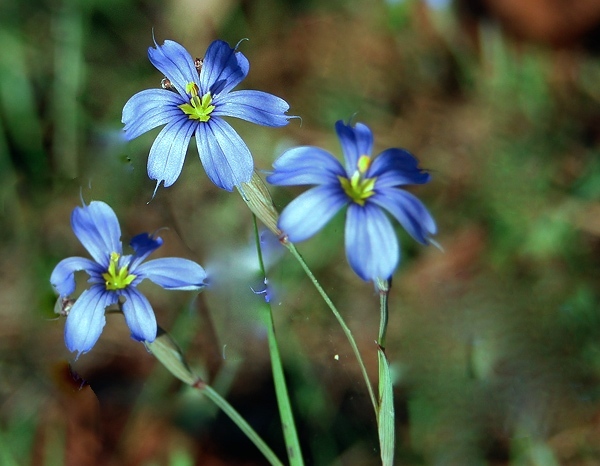 The small flowers shines intensely blue among the brown leaves. So I ask what the color yellow means for Two Dogs. Karen says it’s his favorite color. We have already decided to come back the next day and then I hear my self promising to bring a pot with yellow flowers as a gift from Molly to Two Dogs. Ritva wonder how I can promise that. Where will I in autumn winter, late at night, out in the boonies be able to get hold of a yellow flower in a pot? I answer that if I received such a mission there is no problem. On the way back to our hotel John says that he will go and see his son Jason that same evening has a performance with his band. Of course we want to join. John has never been to the place in question, but it turns out to be a network meeting for business owners in a greenhouse called “Green Garden”. Here are flowers of various kinds and a table with yellow flowers in pots. In addition to there is an extra price. Guessing that Molly was an economical woman. The night before the first time we went up to Two Dogs, I dreamed that the owl on one side had a dove with outstretched feathers like a peace dove and on the other side a crash landing albatross or a big gull. The Sea bird represented to me liberty or a free spirit who lost the wind. I asked John on the way up if he could interpret these birds but just then we found no answers. The owl later became obvious with Two Dogs Totem and the other two I came to understand when I traveled home. Now afterwards, I can interpret the Peace dove as Karen always having the right answer and the crash landing Sea bird as Molly who lost her wind. As we sat in Two Dogs kitchen she appeared for my inward eye in a deerskin suit with a broad white band of white beads on the chest. Karen then told us that she died of breast cancer and with this image, I interpret it to mean that she wanted to demonstrate that she was now completely healthy and free from disease. 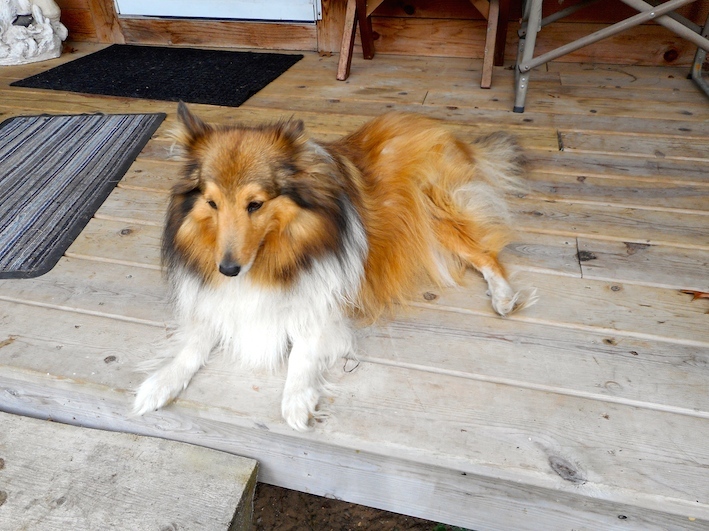 Thank You John for getting us to meet Two Dogs and Karen and for days of sharing existential matters, deep understanding and sense of a loving connectedness. Looking forward to next day with Two Dogs. Kay Pollak a Swedish successful director have said that every meeting is important. With an open heart you may also open hearts. So the success of a connection depends on from what source within we meet each other. 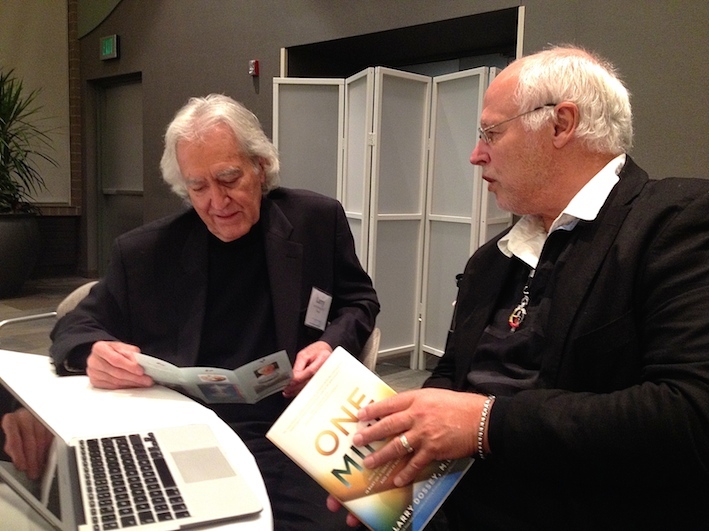 When we use the word “Creator”, we may mean the infinite intelligence that flow through all of us in what Larry Dossey calls “One Mind”. Then we are all one and involved in the creative process. We can also mean our independent consciousness (non local) that operates on a different level than the physical brain and that may connect in spite of distance and lifeforms. The living brain is dependent on life and restricted to different prerequisites to perceive and interpret the world depending on the construction of the brain and its condition. In the quest to understand and explain consciousness, scientists have fallen into neurology, and I believe that this forces the descriptions in a mechanical and biological box that excludes the independent consciousness. So how does the independent consciousness i.e. the soul, interact with the consciousness dependent of the brain? There is a difference between believing that things happen by chance, fate or by intention. There is also a difference on how we treat what happens and what will not happen. Everything brings information and learning. A soul’s independent consciousness does not remove the individual character or the freedom of choice, but let us get a chance to see the big picture. Based on trust and allowing intuition to steer you might find new possibilities. If this is realized in line with a positive desire and good will and, based on humility and gratitude seem new conditions yes even a new world to open up. There are meetings that immediately can initiate good development and transform the future. And such meeting can turn life into a flow of positive events. I will now describe a period of such, how they were initiated and how they led to Grand Rapids and many great experiences including almost magical transcendent. I took on the task of arranging a meeting between two pairs I recently met who I felt should get to know each other. I had at TSC (Toward a Science of Consciousness) Conference in Tucson, Arizona in April 2014 encountered a documentary filmmaker in the hotel concierge room and while we waited to get help, we came to talk film. It ended up in an interview for a documentary. She said the interview could take 30 minutes but we held on for maybe 4 hours and deepened us into life and consciousness issues. The way we met, and how it evolved was as obvious as it followed a manuscript. “Magdalena” (filmworkername) and her partner Dean are two wonderful people and they form a fantastic couple. But they could as I saw it need “promoters” by that I mean a combination of coach, supporter and possibly sponsor. I could see a lot of myself in “Magdalena” when I was young and went on a high-octane energy to take care of myself. Over the years I have learned that we are interdependent. When it works we may function together as a symphony orchestra. But managing a project often needs a conductor, a director, someone who knows where we the project is heading. This also means that someone is clear as to how the results are to be achieved. She was certainly on track. Yet my feeling was that maybe I could be of some contribution. So I heard myself promising a potential financial supporter before I left the US. It’s not the first time my mouth speaks before the brain. I have learned not to drop off what may be regarded as unrealistic wishful thinking. But sometimes mouth nevertheless moves before common sense. I’ve also experienced that a preintuitive mind can capture a creative process which may sense a possibility. Not that preintuition alone create the future rather that it anticipates and kicks off the thought that formulates itself, facilitates and opens up to see the possibilities. On my return home leaving the TSC Conference I sat alone at a table at Tucson Airport when a charismatic couple with pleasant energy wanted to sit down. The woman turned to me and asked if there was a place for them. I had a sea of space for them so it felt just nice. Then could not help but hear their conversation about projects where the figures cited were far above ordinary people’s speculation. We started talking about the TSC Conference and meeting with documentary filmmaker and also how disappointed I was on the contents and atmosphere of the TSC Conference, and how a few are fighting to spread the knowledge of spirituality. But these few are if not directly opposed, yet overlooked, and even considered as weird threatening the mechanistic view dominating TSC. That sentence felt as both inspiring and perplexing and it became a guiding principle for the idea for a new project “Holistic Science of Consciousness”. My relationship to the “Creator” is that it provides a gift to each of us. We are all part of the Creator and thus we all have an individual and collective responsibility for the creative process. My experience has convinced me that we have a self-contained soul-entity. The conclusion is that this independent consciousness can see a good deal more than the brain and body. And it can inspire change (Inspire = in spirit). Life’s driving force is wholesomeness and seeks what is favorably. This is Succébo as I explained in the book with the same name. The third book in the trilogy, “Try again”, is about the conditions for its own development and for coexistence. (This book is not yet published). In the second part, I present “Twelve Senses” and how consciousness may have different conditions based on the body, brain and the Soul thus the latter also independent of a biological life. This book has also been developed and added to a theory of dimensions so you can see it as two different books or a book that has been supplemented. Taken together, these books are the result of 20 years of research, where the common thread is that we strive for personal growth and a better society but seem to have to examine all evil to teach us what we do not want. Blaming God for allowing evil is thus a wrong mindset. Free will is a God gift for each individual to be able to choose its way and being subjected to trials to develop. The way to collect knowledge and evaluate is science. The forms of science allows not only the natural science reduction method but a variety of methods and expressions. Relationship issues can be; physical, mechanical, mathematical, philosophical or spiritual. The spiritual perspective hold the others but mechanical rarely holds more than itself. Then we get such nonsense such as “man is a machine.” No! Man is much more than that, above all, she has a soul that with great difficulty sometimes can penetrate the brain and convey essential information that the body / brain can not possibly have access to. This is to some a controversial position that could be construed unreal in the mechanical scientific approach. The rigidity and hostility to a spiritual approach can take extreme forms, and through Google get a spread of malice. 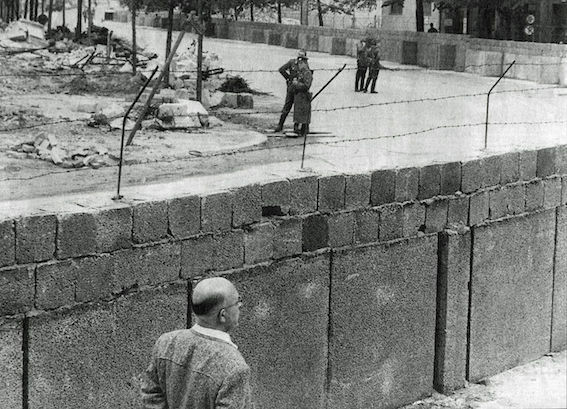 However, like the Soviet Union and the Berlin Wall fell, the new atheism will fall (The struggle for humanism). People have within them a sense of being more than flesh and blood, conditioning and manipulation. We need forces that can inspire liberation from the ego power in whatever form new atheistic or taliban religious. I think many are fighting against it without knowing exactly what they are fighting against. Many may not even want to see the opponent only know what they wish for and like to achieve a better world. Magdalena’s documentary about consciousness seemed to me to be an important project, and if I could somehow help, I wanted to do it. When Larry Dossey invited me to his lecture in Grand Rapids (LINK), I remembered the meeting with John and Amanda at the Tucson Airport. They stood by their invitation for me to come and therefore I suggested the film team a joint meeting in Grand Rapids. It also worked for them and they came flying in from different directions. Already this commitment testify that the creative force will overcome any resistance and may enter a flow. I wake up 6 am local time at this luxury hotel overlooking downtown Grand Rapids. Ritva sleeping and needs a few more hours. Although there is a six-hour time difference and the time is closer to 12 in Sweden, it has been a long journey. I take the elevator 17 floors down to breakfast restaurant with my laptop and can work undisturbed in a corner at the far end. Many contacts are to be taken, and meatings to be prepared. I also want to update the research about location and population. Three hours later, Ritva comes and other hotel guests are filling up the restaurant. A guest tells us that there is a convention on drugs and related problems at the hotel. He advises me to contact the leaders when he believes that I have the skills to communicate some new facts. I’ll leave my card so we’ll see what happens. We installed ourselves at the new hotel near the Fredrik Meijer Gardens where the conference would be held later in the week. It turned out to be out in the boonies and not a store or restaurant in sight, but close to center so no match to grab a taxi. But we had booked a meeting with John later in the day so we thought it was best to wait. It turned out that he was so busy to complete and manage their projects, pending a longer vacation, it was evening before we left the hotell. He took us to a gourmet restaurant with Asian food. Among the best dishes we ate. John wondered if we would visit a Native American who lives in the woods an hour north. Of course we would love that! John phoned directly from the restaurant and we got the visit confirmed. I could not be more grateful and interested. The next day we would meet Linda and Dean. One of my commitments was to bring them together with John and Amanda. Now things begin to happen! 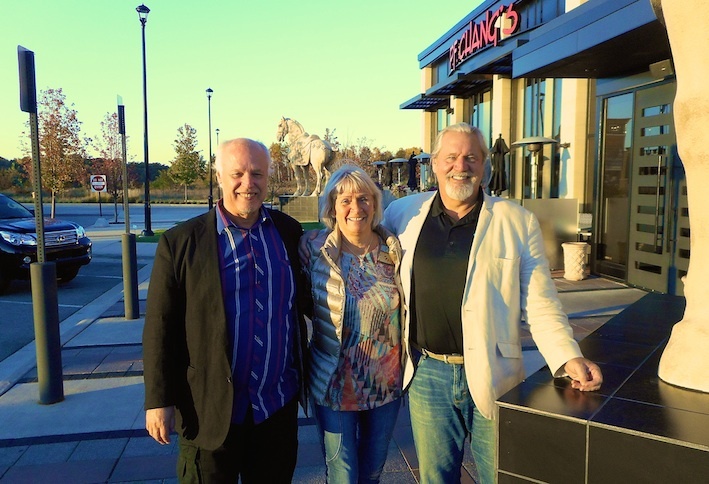 Ritva and I made a trip to Grand Rapids, Michigan, United States, 20 – 27 th October 2014 that was momentous and significant in many ways. It’s important to remember the details, sequence of events and the people we got to meet when there were so much synchronicity and what I have come to call preintuition. It is stronger than hunch but not precognition. It’s not intuition based on skills and knowledge, and is therefore pre-pattern recognition. The closest you can come is perhaps premonition but the term is often associated with and restricted to the warning. Preintuition is of great importance to creativity and sense of opportunity and sometimes innovative cross-border nature. I’ve written about it in Succébo – The seeds of Success (April 2011). But back to the trip, a new discovery. 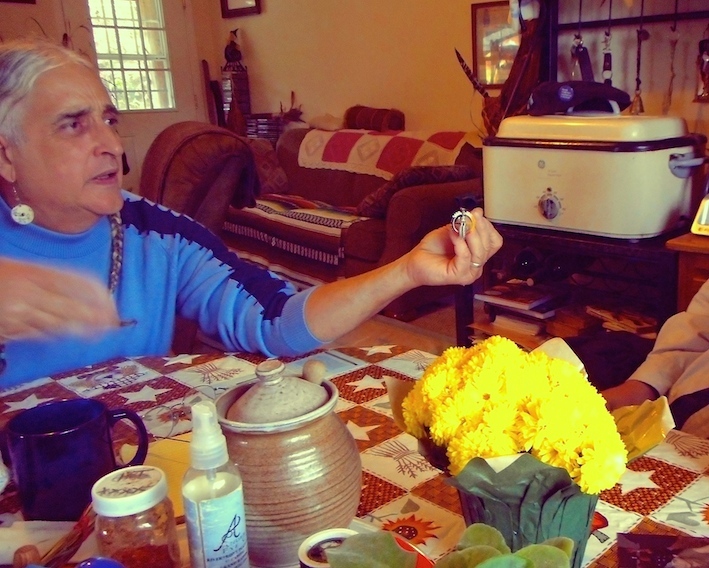 Before we left our home in Enebyberg north of Stockholm, I took an amulet that bestowed me during a stay in Nova Scotia, Canada in 1996 when we were invited to get involved in what turned out to be Miq Maq Indians’ first lawful ceremony dedicated to their great spirit Glooscap LINK Painting. It was not allowed to take photos so I painted a watercolor and then arranged an amulet in accordance with the chief and medicine man’s advice: “Pathfinder,” a bear head in the shape of a circle. 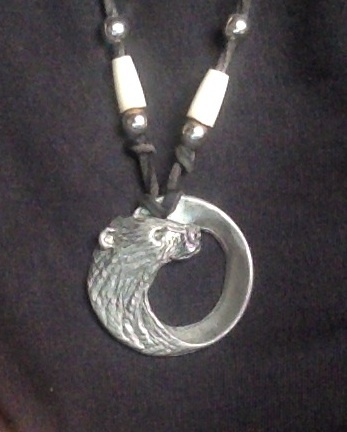 Faced with this new journey I was about to put the pathfinder amulet around my neck but changed my mind and told Ritva that it did not feel right. Why I did not know then, but it would become clear later. The trip to Grand Rapids had the ultimate aim of meeting Dr. Larry Dossey at Frederick Meijer Garden in Grand Rapids, Michigan, USA 25 oktober 2014. We would listen to his lecture at the conference “Universal Health Solutions – Medicine Beyond Medication – Conference”, with a focus on integrative (contemplementary) medicine. During my project “On Origin of Consciousness” I had found Dossey’s texts and been impressed with both his knowledge, attitudes and ways to express profound questions. 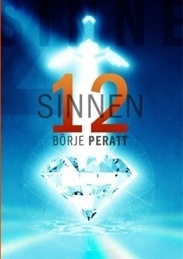 2010, Professor Adrian Parker read my book 12 Senses, (Tolv Sinnen) as peer review, made ​​a positive statement and added some flattering comments. Professor Parker clearly had a good relationship with Dr. Dossey, told him about my book and it led to Dossey contacted me. This for me cataclysmic event took place in 2013 and we had just over a year of frequent e-mail communication and discussion of different theoretical contexts and concepts. Said and done. We took a week and landed at Grand Rapids Airport after 18 hours with a stopover in New York. It proved difficult to get a taxi driver to found Wheelers address. It was a bit out in the woods surrounded by a meandering stream with a small waterfall. 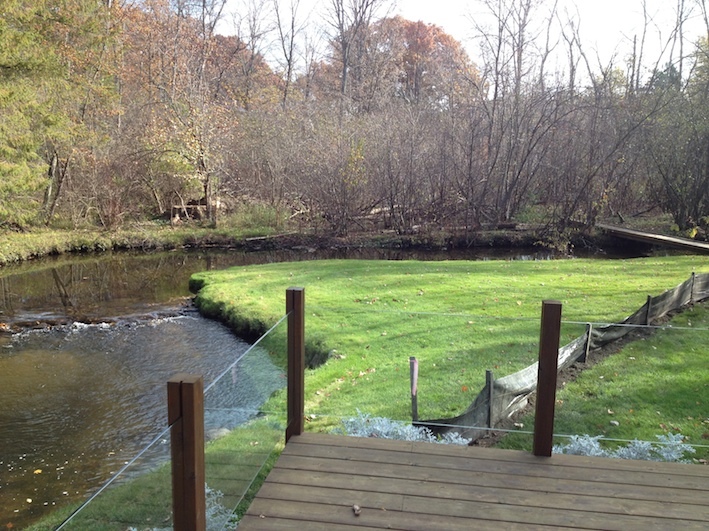 The river was right next to the porch so you could sit with a fishing rod from the window if you wanted to. I understood that Wheeler had found a dream place. I have sometimes said that I would want to live so but hardly imagined that there were such places. Their habitat their generosity and affection was a powerful experience. The diary of the trip to Grand Rapids continues with future articles. 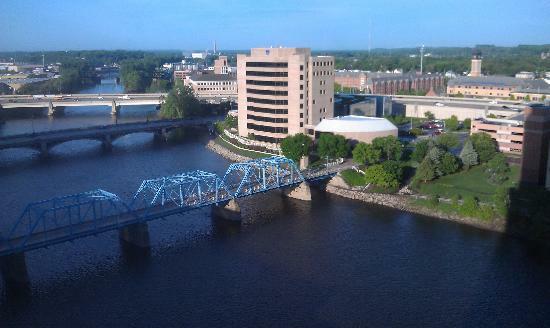 Grand Rapids is a small town in the state of Michigan, northern USA in the middle of the “Land of Plenty”, surrounded by Lake Michigan and Chicago to the west and Detroit and Lake Huron to the East, one and a half hours on domestic flights from New York. 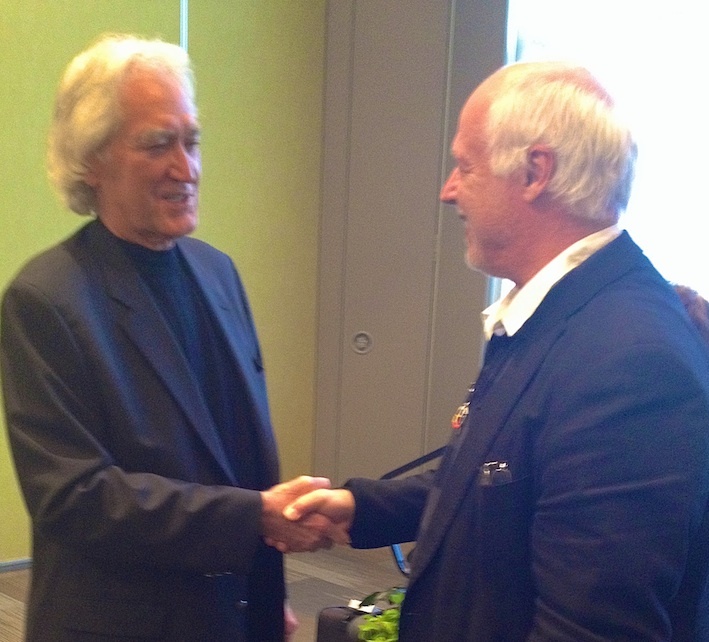 My visit, in end October 2014, is prompted by an invitation to a lecture by Mr. Larry Dossey – MD, scientist and author. I will be speaking at the Universal Health Solutions Medicine Beyond Medication Conference, focused on #integrativemedicine, October 24-25. The conference will be held in #GrandRapids, Michigan. I would love to have you join me! Medical professionals, students and the public are welcome. But do you really travel 18 hours over the Atlantic Ocean for a lecture. Normally not so what could give this motivation. 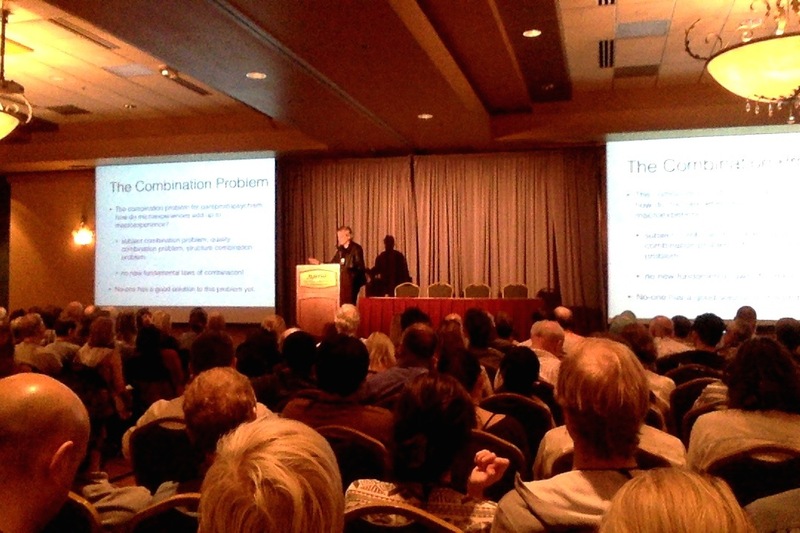 Prior to TSC Conference (Toward a Science of Consciousness) in Tucson in April 2014, I had contact with Dossey about the content of that conference and why he did not consider it worthy to attend. TSC proved in practice to be locked in a physical mechanistic theme whose main objective is assumed to be answering consciousness based on the brain’s biological function. What you might be able to explaine by such an approach is possibly a brain mind and perception. My interest is the more spectacular consciousness phenomena summarized as transpersonal experiences. Why would I then still go to Tucson. Well I had expectations about more than what it turned out to be by my involvement in a similar TSC conference in Stockholm 2011. Thought it was worth investigating (the presumed) progress and it was worth it to meet other researchers in the corresponding fields. There were also themes and workshops that could be interesting. But I became in my diary from the conference increasingly critical and I found a possible sort of close to betrayal of participants who sought new information and updated research on consciousness. By far the greater part of the contents turned out to be brain function (brain mapping) and perceptual possibly interesting for neurologists. There was also an attempt to explain consciousness in quantum physics. Nothing new under the sun came out during these lectures. In practice it turned out that many alternative seekers who attended gave a kind of alibi for a content that was purely illusory. In fact, the TSC is probably a misleading name. Instead, it should perhaps be named TUB, Toward Understanding the Brain. Final straw! The last lecture of the Conference on NDE was (Near Death Experiences) from two speakers that practically lacked elementary knowledge of what NDE is. A scientist who killed rats believed to have found the moment of NDE by measuring what he considered to be the moment of death. This study I dismissed in the article in my diary from TSC: “Final day of TSC Near death experience? What!” . A more famous debater in the area Susan Blackmore paid to debunking earlier claimed to have had an NDE after several hours of gameplay on the Ouija board, stoned on marijuana. The kicks, which she mistakenly called NDE, she has since, quite rightly, dismissed as hallucinations of the brain and from there taken the step to dismiss NDE as phenomena. When such a frivolous observation may prominently at a conference, you have to actually ask both subjects, content and implementation. This scathing of transpersonal experiences perhaps most scientifically documented phenomenon revealing to the TSC in effect sided with the pseudo-skeptics’. And thus it has allied itself with pseudo-science inquisition in the form it has adopted with the support of IHEU and CSIcop. Way home from TSC in April went through Tucson Airport and with plenty of time, I took a place in a restaurant. After a while, a couple sat down at the next table. I registered directly charisma and the positive atmosphere around them. Took out my laptop and started writing down ideas about how a conference should be designed that I could find intersting. I also had in mind the meeting with filmmaker Magdalena who was about to make a documentary based on different theories of consciousness, meditation and healing. She had intervewed me and would then fly away and do an interview with Larry Dossey !!! I had told Magdalena that before I leave USA I should meet somebody who might be interested in supporting her project. There was now this couple next to me and we got to talk about what prompted visiting Tucson. I told them about Magdalena’s projects and about my idea for a new kind of conference. They showed interest in both of these topics and invited me to their small hometown of Grand Rapids in Michigan that they felt would be perfect for such a conference. There is much you can say and promise in such meetings but there was something here that aroused curiosity. Creator put us together, consciousness will determine the next steps we take to improve this planet and all its children. When Larry Dossey invited me to his lecture in this city, I remembered the invitation from Amanda and John and additionally another interesting contact near Grand Rapids that also talked plenty of that particular city. It was too much synchronicity for not taking a quick decision to go. I also had a feeling that I might be able to learn more about indigenous people (Native Americans) in the area and had an unrealistic desire to get to a meeting. Maybe not the same as I have experienced in Nova Scotia in Canada 1996. Mic Mac indians ritual to the Great Spirit Glooscap. 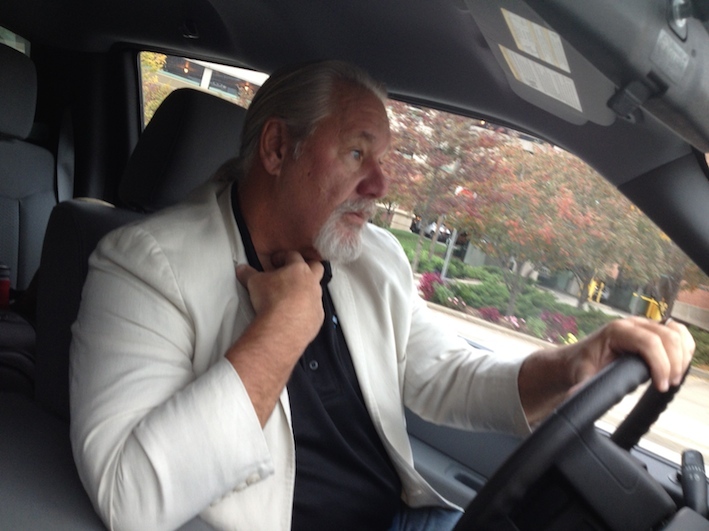 So when I sit in a car with our host John talking about my desire to learn about the history in Grand Rapids he says he is a Native American and is good friend with the local tribe’s spiritual leader. This meeting we’ll take place on Thursday 23 visiting the lodge of the spiritual leader. Going North! Hoping to tell more about it soon. The unitarian priest Raymond Bennett Bragg took the initiative to form the International Humanist Movement. 1933 they published a Humanist Manifesto. The movement wanted to clarify the dividing line between belief and knowledge to distinguish between what belongs to the realm of religion and science sphere. The community needed spirituality, human rights and secularism of religion and freedom of science. The movement would promote unity, not division. The manifesto was signed by 34 of this time influential people, 15 of who belonged to the Unitarian church. A ”Secular humanist” meant a believer or atheist humanist who distinguished faith and science. This was later distorted towards a pure atheism today new atheism. The difference is that an atheist can respect other beliefs a new atheist don’t. Publication of the Humanist Manifesto II, 1973, the fight for atheism and against religion itself was the starting point of the movement’s activities. This involved using entrism infiltrating strategically important institutions in society, such as the annexation opponents’ concepts and slogans. Here was born the skeptic movement that went further than atheism, claiming God’s non-existence, which is pseudo skeptic since you can´t proof it. Kurtz was also the one who instigated the criticism and persecution of the paranormal. During the 1976 convention of the American Humanist Association Kurtz and Professor Marcello Truzzi instituted CSICOP, The Committee for the Scientific Investigation of Claims of the Paranormal, now shortened to CSI. This organization would investigate the facts concerning paranormal phenomena, but the goal instead turned out to fight faith and spiritual belief. Within a few years after the founding of CSI Truzzi distanced himself from the organization because as he pointed out it consisted of fake skeptics who were not interested in investigating the truth of spirituality and paranormal phenomena. Truzzi coined the term pseudo-skepticism of activists based their actions on prejudice and dogmatic rhetoric which is contrary to scientific ideals. Kurtz then wrote A Skeptic’s Handbook of Parapsychology (1985) to harsh the method when confronting the ”enemy” that is people not doing or believing what is within the frames of CSI. This headline from The British magazine New Humanist (2011) summarizes their hooligan actions and pursuit of people with differing beliefs, views or philosophies. I made ​​it my duty in Sweden to confront, expose and portray them. I drew their attention and their malice. In addition to the net hatred they hijacked my identity, it was also some other strange effects, but no major damage. CSI´s international wikipedia guerilla is antihumanistic and antidemocratic. To challenge them requires an interacting cooperating strategy. ”You have enemies? Good. That means you’ve stood up for something, sometime in your life. 1) The manifesto was signed by 143 people. 2) Unitarianism is a Christian faith that denies the Trinity and believe that there is only one God. Jesus was an ordinary man. The movement is considered to have been founded in the 1500s. It ran in the United States an uncompromising line against slavery and spread message of freedom and democracy for all. Among the thousands of members we find Charles Darwin, the modern theory of evolution founders, Charles Dickens, British socially critical writers, Thomas Jefferson, America’s third president, Florence Nightingale, the model of care for the wounded in the field that later became the Red Cross, Mary White Ovington, American suffragette, Mary Wollstonecraft, liberal feminist, Ram Mohan Roy, Hindu reformist and Albert Schweitzer, German physician and pacifist. 1) Antonio Gramsci (1891-1937) Italian Marxist philosopher developed entrism which involves via infiltration taking over the institutions, organizations and public institutions. 2) In Sweden, Science & Popular Education (VoF) and Sister Association The Humanists are known for aggressive attacks on their opponents. In a VoF campaign 2012 ”Action against the anti-vaccine people” the skeptics donated vaccines to Africa attacking the vaccine-critical information site Vaccin.me. An employee of Takeda (pharmaceutical companies) HG wrote in his three deed of gift in the Vaccin.me editor’s name as follows: ”I want to kill 20 children in Africa.” ”Artificial death to Africans”, ”Children in Africa are plagued with Big Pharma’s vaccine devil”. Another person AT wrote in his deed of gift, ”Have by UNICEF also donated 60 doses of polio vaccine. To the writers of vaccin.me we send two gift certificates also hoping that they will be forced to run the gauntlet in the media ”. 3) New Atheism was coined as Richard Dawkins, Daniel Dennett, Sam Harris and Christopher Hitchens appeared together at a public debate in 2007 under the name of ”the Four Horsemen of New Atheism.” They have inspired persecution of people with what the consider ”fail” philosophy of life or faith. 4) Demagoguery means to argue on the basis of unreasonable arguments and prejudices. The challenge relates to “the hard problem” and “body-mind-soul” problem. To descriptively explain these conditions and experiences are considered in the areas of science as more or less impossible, it is called Qualia. Qualia means “what sort” or “what kind”. The term is referring to individual instances of subjective, conscious experience that allegedly to be unable to describe, such as the taste of chocolate, the experience of a color or physical pain. How qualia should be understood is a central problem in philosophy of mind. It is considered a fundamental problem for materialist explanations of the mind-body-soul problem. It is therefore assumed that qualia can not be explained within a neurology concept or by cognitive science. I agree that we can not explain the mind-body-soul problem materialistic because that’s just a non-materialistic issue. But on the other hand The hard problem is a physical problem that can be explained by physical concepts and cognitive science. It is thus an important position to separate the The hard problem and the “mind-body problem” and “body-mind-soul problem” because they are completely different problems. I guess shortcoming regarding this may be because for example Chalmer’s description has not been based on origin of consciousness and its various degrees and dimensions. There is a few attempts in that way which I highlight in the book Twelve Senses from 2012 and has developed further in the sequel “On Origin of Consciousness and 12 Senses” coming out in late 2014. The simplest explanation of the theory is to divide consciousness in a body mind and a brain mind , where the latter has been developed from the body consciousness. But there is also an awareness that is completely independent of body and brain, and also interacts with the body and brain. I call it the “independent mind” (IM). The prerequisite for the interaction between IM and the body I specify until further as an existential hub . In my theory, it is a genuine nut to crack. Back to challenging Qualia. I explain my theory in terms of body senses that was necessary for creating body consciousness already in the beginning of physical life. This theory I have developed in the book Succébo – seed to Success (April 2011) and Twelve Senses (2012). If we consider these experiences as natural survival functions, we can see that the taste was a necessity to avoid unfavorable food. Taste has a direct and decisive influence on the choice of food. We have named such properties in our advocate to communicate sour, sweet, salty and taste qualities based on sensory impressions of different varieties such as honey, cinnamon, blueberries, barley etc..
Man is not alone in marketing good “restaurants”. Karl von Frisch received the Nobel Prize in 1973 for his studies of the behavior of bees. He interpreted bins complicated dances and described them as a way to communicate. The bee has a highly developed ability to communicate its findings of nectar several miles from the hive and may with a complex dance tell other bees where to find it, what quality it has, how much and what type it is. (Page 180 Twelve Senses , 2012). In Qualia world it is believed that color and physical pain are almost impossible to explain. Also here are the markers already in the origin of life. In the beginning color was crucial for signaling and can be assumed to have initially function as either repelling or attracting. To be able to understand these signals requires the body to be able to perceive them. If there were not eyes how could these bodies still register these signals and communicate back? Skin mind have receptors that detect various frequencies. All of these have the starting point in three basic colors or primary colors, probably red, blue, yellow that can produce all other colors (go ahead to test this hypothesis). In the case of the body experiencing pain and pleasure these feelings are derived from the Emotion sense , a sense that science has not yet named or even accepted (go ahead to test this hypothesis). I propose that the emotion sense has its embryo in the early lives of evolution and that emotion may initially be a pure protection mechanism to avoid injury. This brings then the experience and development of memories. Development of fertilization conditions resulting in positive emotions such as enjoyment and satisfaction, and thus follow empathy, love, etc. as conditions for the survival of the race. With the experience of harm and malice follow all the negative emotions, anger, hatred, revenge. Prospects of survival is linked to the source of aggression neither good nor evil but a necessary will power to get something done for good and bad. Possibly aggression is life’s most original drive and then Freud got that right. But without the unconditional love life would not have survived so the question is what comes first or if both occurred as parallel conditions, or even part of an infinite intelligence that can be transformed into life. 1) Artificial Intelligence involves an ambition to strive for the brain’s intelligence and to create solutions that mechanization of intelligence. Besides ethical complications, such as technique never become aware or make free choices. That there still is such a desired direction a consequence is, the stimulating research that wants to highlight that people do not have more than a brain awareness which is unreliable and controlled by simple stimuli. There is a political economic willingness to let an artificial consciousness take over certain decision functions to avoid human error and gain control over certain functions. In additive color mixture, for example in television, we usually use the primary colors red, green and blue (RGB abbreviated). In subtractive color mixing, such as the printing, we usually use the primary colors cyan (greenish-blue), magenta (blue-red), yellow and black (abbreviated CMYK). CMY are complementary colors to RGB. 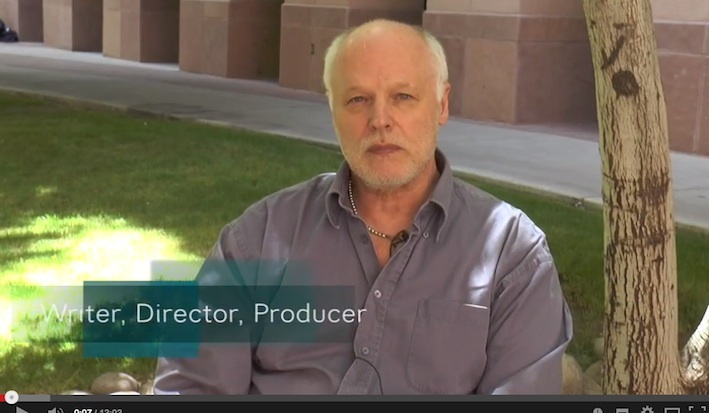 In April 2014 I participated in the week-long conference Toward a Science of Consciousness. My diary here. (Länk), Day 1, Day 2, Day 3, Day 4, Day 5, Day 6. Chalmers’ statement: – “It is widely agreed that experience arises from a physical basis,” Is that true? Is it generally and widely agreed? In the quest to create stable explanations for consciousness researchers like David Chalmers gained much importance. But based on my research his perspective leads straight into the physics materialism even if it is quantum. The simple explanation for this belief is that Chalmers and the majority of these scientists are stuck in the brain consciousness and seeking neurological, biological, physiological, mathematical, physical, and especially quantum explanations. But what if consciousness is not created in the brain. What if the thinking capacity has a non-physical immaterial origin? Well the brain is very important for the living body and you can see the brain as a communications vessel for consciousness. When the work is all fine and dandy you can sit back and let it work but when the vessel is turned off, degenerates, or a person is under strain, a parallel consciousness or rather the origin of consciousness may emerge. In some people is this awareness space more or less constantly present as a fluctuating ocean. This is also a way to explain the so-called transpersonal (paranormal) experiences. Having said that the author or Lanza still directs a theory of quantum to explain consciousness. Since Lanza believes in Biocentrism and has stated “Quantum physics proves that there IS an afterlife” we must conclude that his solution to consciousness is Quantum physic. But is not also quantum matter with its smallest components, quark particles? Chalmers contrasts the Hard Problem with a number of (relatively) Easy Problems that consciousness presents. He emphasizes that what the easy problems have in common is that they all represent some ability, or the performance of some function or behavior. Qualia is a term used in philosophy to refer to individual instances of subjective, conscious experience. The term meaning “what sort” or “what kind”. That is, the feelings or experiences that allegedly are not able to describe, such as the taste of chocolate, the experience of the color red or physical pain. How qualia should be understood is a central problem in philosophy of mind, as it is often seen as a fundamental problem for materialist explanations of the mind-body problem. It is therefore assumed that qualia can not be explained neurology or cognitive science. The starting point that conscious experiences can not be explained with brain mapping or cognitive theories might be a progress. I believe that the conscious and subconscious has its place in an existential hub that brings together sensory experiences, reflections and experiences with an infinitely wide awareness of non-physical origin. Thus falls Chalmers assertion “It is widely agreed that the experience derived from a physical basis”. Instead experiences derives from an metaphysical intelligence. It also explains the hypothesis that we know before we understand and life is to find out what we already know and to develop our understanding of it. Just returned from EUROTAS Transpersonal conference on Crete Greece. Have learned some more about how I think a conference could be better structured and organized. There is a need to create cross border meeting and communicating workshops where people i.e. the participants can be able to express and develop. Not only listening to a speaker. This is my field so I think I know how to do it. I don’t know though how it can eventually integrate in other fields that needs a speaker or if it just is complementary. This will be an interesting discussion. The one I mostly want as speaker is MD. Larry Dossey. We have had a long time conversation and deeply understand each other. At least that is my impression. Mr Dossey recently invited me to a speech in Grand Rapids Michigan 10/25. That is really spectacular since I at Tucson Airport and at TCS met people who wanted me to come to Grand Rapids for the arrangement of a new conference that I have outlined here. New friends have invited me as guest and I will stay by them 10/20-10/24 meet Larry Dossey 10/25 and then flying back on sunday morning 10-26. 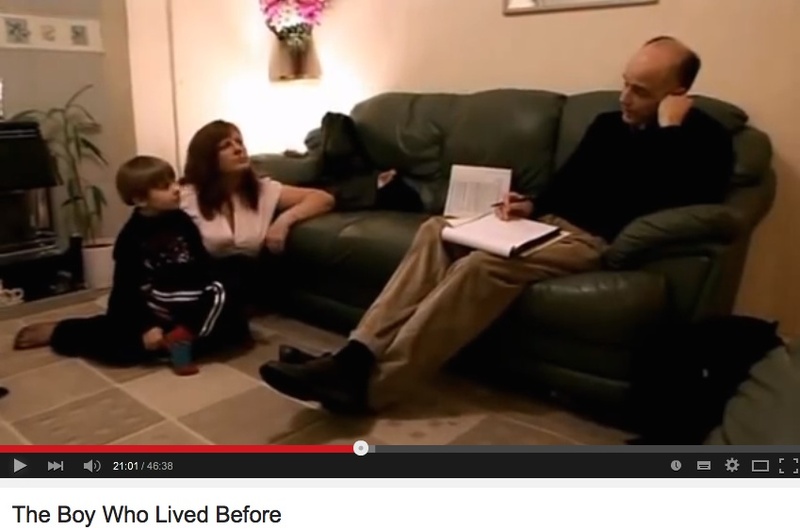 Will also meet Tom la Frambois who is into reincarnation therapy. We will all meet in Grand Rapids. I will be speaking at the Universal Health Solutions Medicine Beyond Medication Conference, focused on #integrativemedicine, October 24-25. The conference will be held in #GrandRapids, Michigan. I would love to have you join me! Medical professionals, students and the public are welcome. #CME Credits are available. All this is exiting and what comes out of it is written in the stars. We are delighted to inform you that Electronics and Communication Department of Amal Jyothi college of Engineering(www.ajce.in), Kottayam, Kerala,India is organizing an International Conference on Quantum Mechanics and Quantum Consciousness from January 6-9,2015. NLP, CBT and other Transformational Tools. The last date for paper submission is 20th OCT 2014. The selected papers will be published in IEEE and in the International Journal for Transformation of Consciousness. Our keynote speakers are Amith Goswami (Professor of theoretical nuclear physics,University of Oregon ,USA), ECG Sudarshan (Professor,University of Texas,USA) and Prahlad Vadakkeppat (Associate Professor,National University of Singapore ). More details can be obtained from the conference website http://www.icqm.in. Please forward this information to your colleagues and students . I would like to visit Kerala but there are only two themes in this Conference that might to be of some interest such as Consciousness Discussion in Ancient Knowledge and Hypnotherapy NLP, CBT and other Transformational Tools. I think this two will drown in all the rest and that the participants might be more interested in physics than nonphysics. Wish the conference best of Luck and will spread your invitations through my channels. Characteristics of a Spiritual Warrior – Happiness is every person’s choice, but few make an effort for it. I found this article and would like to spread it. So I only present the first part and the you can follow the link. The Spiritual Warrior is a person who challenges the dreams of fear, lies, false beliefs, and judgments that create suffering and unhappiness in his or her life. It is a war that takes place in the heart and mind of a man or woman. The quest of the Spiritual Warrior is the same as spiritual seekers around the world. The Spiritual Warrior faces this challenge with the clarity and awareness that this war is fought within himself and that Truth and unconditional love are on the other side of these battles. This is what the Toltecs refer to as Personal Freedom. You can find this referenced in the book The Four Agreements by don Miguel Ruiz. I found this article and want to republish it since it is coherent with my findings. The Brain Does NOT Create Consciousness. It is your soul. Channeling is an experience of a directly transferred intent from a spiritual dimension. The condition is characterized by a sluice-like openness. The critical investigative, rational thinking replaced (usually) by an openness to limitless creation (compare with hypnosis). The state of this may be in dream, transportation or during meditation. A psychic communication can be part of an ”exploratory intelligence” that allows cross-border and contribute to both problem solving and innovation. There are also those that describe this communication as a one-way monologue. When a person becomes a ”secretary” for a spiritual mediated ”sermon”. This tradition to just ”take dictation” and write down God’s words conveyed ranging from Moses and the stone tablets to Therese of Avila (1515-1582) and Neale Donald Walsch (1943 -) and his book trilogy ”Conversations with God”. Whatever one believes they have conveyed remarkable words. These inspiration condition can mean that channeling is a form of communication and dictation-taking which sometimes seems to be outside the recipient’s own comprehension and knowledge. Such channeling also occurs in dreams. If we assume that this inspiration gives rise to different ways of creating and communicating, there is also reason to wonder whether this consciousness can be conjured or if this “window” is opened by some kind of transpersonal experience of divine grace. Being in the flow is as to get good result in an easy and obvious way. The characteristics of this condition is that some minds are open and describes a mix of positive emotions of love, joy, peace and happiness. Nothing is impossible. Flow can also offer a creative and intuitive mental elevation, as if you get inspiration from another dimension. The Spanish Carmelite nun Teresa of Avila (1515-1582) described her writings as a ”parrot”. She just repeated the Lord’s word, without understanding any of that she wrote. She got what she described as intellectual visions and revelations of God, which means that the senses are not affected, but the visions and the words seemed directly through her own consciousness. ”The Way of Perfection” (El Camino de perfección) are considered to belong to the Christian mystical masterpiece. It is a systematic representation of the stages of the soul’s path to union with God. Teresa of Avila is declared a saint and protector of the people who are being ridiculed for their faith. Established writers, artists and even scientists have mentioned similar experiences as means to get ideas or creative solutions ”from above”. Of concerns about not being taken seriously, it is understandable that many remain silent about this possible transcendental contribution to its creation. In the 1980s, I wanted to make a documentary about intuition, but it was considered frivolous and I was adviced to not do it. Then, intuition and self-healing through placebo still were suspicious themes. Today it is okay to discuss them. Already Plato (347 BC) indicated an alternative mind. Plato said that he got Phaedrus dialogue in the work ”Symposium” in a supernatural way. William Blake (1757-1827), whose poem has inspired films like Chariots of Fire, claimed he wrote Milton and Jerusalem through immediate dictation. On his deathbed he told that several of his works were a product of heavenly friends. Alfred de Musset (1810-1857) Member of the French Academy, acknowledged that in the literary creative process involved a kind of spiritual guidance. The explanation to the inspiration of the story in the bible (Mark 16:1-14) about Jesus’s resurrection is similar or can be related to the explanations above. The body has a consciousness that is based on the senses that science has not yet fully understood. When that day comes, we will have a different focus on health and body relationship. The hypothesis is that: body awareness already exists in the cell and evolve with the advent of the first neural net, and then a nervous system. Before the brain is formed and when the body was headless, was a body’s own ’consciousness’. Corals are usually single-celled animals like jellyfish. They lack the head and brain but has a neural net and can feel touch, pain and the presence of certain chemicals in the water. However, they can not determine from where a stimulus comes. During evolution a nervous system is building up along a spine with nerve fibers along the membrane / skin. Here I assume an initial emotion mind. For the cell to be able to receive and transmit signals requires a communication sense. In the still headless body develops gradually a preliminary stage of the brain. Cell research is continuing to bring new perspectives to the cell function and capacity. The cell does not seem to respond quite mechanically but can treat manipulation based on a kind of cell integrity. ”I’ll decide.” Let us assume that the smallest organism can have a kind of ”cellular consciousness” that is able to rate the conditions of its organizm and environment. Grading is influenced by how the cell perceives the influence of ambient and direct intervention in the cell membrane. External influences which activate all of the cell’s needs. Environment, and external processes of change can lead to mutation as well as to the cell on its own is able to mutate like life’s own innate quest for more favorable circumstances. With an initial ”body consciousness” is a kind of cellular intelligence that turns the functions necessary to sustain life. The cell mutating serves all expressions of evolution. The first sketches for different species plotted thus in unicellular organisms. These tiny microorganisms can both orient themselves and communicate and it gives impetus to such mutations that give life to new conditions. From unicellular organisms surrounding membranes developed cells with increasingly effective skin protection. The task is also to through the skin get a sense of heat, cold, pain and touch. The skin is the body’s largest sensory organ. Touch receptors are located at the top of the dermis, where they receive various external stimuli. The internal receptors regulates the autonomic nervous system. At disagreeable contact starts an escape-like reaction. At pleasant stimuli activated wellbeing hormone oxytocin. Both emotion reactions are indicated at first as an impact on heart rate before they reach the brain. So before the brain was in place all this took place soly in the body. This fact explains the emotions in the body precedes the brain’s interpretation and the experience relayed. I assume that already in the cell there is formed an ECO center , a cellular consciousness that perceives, communicate and orient the cell. – Emotion mind experience fear, anger, attraction and reluctance or disgust was initially spread in the skin’s sensory receptors. The assumption is then that skin sense generates emotion sense. The premise is that emotions have originated physical expressions. In the beginning these emotions had the purpose to avoid being hurt or what seemed dangerous and inedible. – Communication mind, is necessary for internal communication and body consciousness, the cell externally confined by a skin-like membrane cohesive surface to prevent the body to be dissolved. External communication could convey vibrations exchanging information about friend, foe or opportunity. Gradually developed this mind and allowed for ”social” interaction. As in microorganism and bacterias. –Orientation mind became important to be able to orient themselves. A sense of direction changed the conditions of the organisms and made it providing the ability to perceive, experience and interpret emotions, to communicate through touch, vibration, colors, odors, chemicals, vocalizations and body language and to orient themselves possible to convey location information and to move in the desired direction. With the view of evolution as innovative and possibly intentional, it leads to an assumption that life is trying different possibilities to orient and move. The urge of knowledge was initially a need to orient themselves towards different sensory information such as light, darkness, cold, heat, wet, dry, hard, soft, to actively search for food, and opportunities for reproduction. The orientation of consciousness need to strengthen the capacity, creating more favorable positions, proven life also proved new ways to move. Mutations gave fins, legs and wings. At first, navigation skills was insignificant especially for those organisms that only followed the water streams or ended up where they ended up in the earth’s soil. However, experiments at single cell level hav demonstrated that certain cells placed in a barrel approaching nutrient solution and escapes poison. Others that cells van orient towards food. This requires a sense and perhaps also some communication between the cells. The issue of emotions is perhaps more spectacular but if a cell escapes a poison it implies the possiblity of some kind of emotion. Gradually, evolution created life forms which can move in different directions and being goal oriented which improve conditions for getting food and shelter. The ability to move in the right direction requires a sense of direction which even appears to work telepathically (compare to the slime mold). The ability to perceive the environment, its danger and opportunity provides a basis for considerations and strategies and requires a communication which coordinates a crossroads. Early in evolution communication was basically signaling through vibration, through body movements that could get a unicellular protist organisms interact with other single-celled animals and move toward a common goal. Communication among autonomous individuals developed with the ability to spread and absorb odor trails, feelers, send and perceive signals, shaping and receive sound. 2) Eco Centre: Emotions- communication and orienteering senses. Opposite approaches of beliefs, science and the value of life. – Human beings are under the control of genetic codes and chemicals and the purpose is survival. – The brain is a physical organ confined mainly controlled by intercellular processes. – Time, space and life is finite. – Thoughts are dependent on a living body. – Nothing travels faster than light. Against this stands a world that does not accept these statements as anything but an ignorant and narrow approach that only sees the limitations of a physical body and not the soul’s vastness. – Man is a spiritual being under the influence of their thoughts and emotions. The aim is to create a meaningful and fulfilling life. – Consciousness is divided into a physical ”brain consciousness” that has limited access to a comprehensive and independent mind. – Communication does not take place mainly in the biological material world, but in the subatomic invisible world. – There are physical senses (dependent of a body) and there are independent senses (The minds of the Soul). – Independent consciousness is independent natural laws limitations. The conclusion is that consciousness creates the world and that consciousness exhortations provide effects. Have we heard that before? It reminds us of ”God hears prayer” or that – the Universe responds to what you plant. Consciousness is then the mind’s and the thoughts’ immediate impact reflected in different ways. I needed to express an experience and came up with this sentence. I have subsequently learned that the most rewarding, stimulating and beneficial communication is from heart to heart. What reaches right into an open and generous soul and requires nothing but courage. Quote: The Mind Dimensions & Twelve Senses will be released in automn 2014. During the translation process of the Twelve Senses, I come across pieces that call for more attention and elaboration. As a result of the translation work, is also the revised edition being improved. The text below is about the premise of the transpersonal consciousness with its spectacular phenomenon. What I find very interesting is how the mind can not only work but get super ability regardless if the brain is more or less disconnected. ”The data support a neuropsychological model that proposes that spiritual experiences are related to decreased activity of the right parietal lobe, which may be associated with decreased awareness of the self (transcendence) and increased activity of the left temporal lobe, which may be associated with the experience of specific religious archetypes (religious figures and symbols)”. How to explaine that the corresponding transpersonal experiences can be activated if the brain is clinically dead? It’s like watching a TV where the power cord is unplugged. My suggestion is an existential hub that seems to unite the soul’s transpersonal eye with the brain’s cognition (thoughts, memories, beliefs, judgments). But even in a clinically dead brain is the soul’s gaze aktiv. One speculation is that it has a connection with the still-pumping heart which proved to be important for emotions (pp. 28-30), likes and dislikes taste (pp. 44, 98). But this assumption is not valid for Pam Reynolds, whose heart also was turned off (p. 132). If the existential hub is a sluice – will it then open wide when the brain no longer is blocking? And is that the answer to a released soul. 1) My personal view and comment: Brain hallucinations and psychosis (caused by drugs) blocks the availability of independent mind experiences and chemistry play tricks with brain. What this can give more than escapism and the life and health at stake are thus neither my approach or my area of ​​interest. 4) University of Missouri-Columbia. ”Distinct ’God spot’ in the brain does not exist, study shows.” ScienceDaily, 19 April 2012. .
Reason to question the organ donor process? During the translation of the book Twelve Senses, I have come to a passage that evokes not only questions but also provides evidence of radical reappraisal of concepts such as clinical death and then also organ donation. There are lots of perspectives. One of them concerns the possibility that a patient is not dead though medical technology and expertise provide 100% proof of it. When the brain stem, the only part of the brain that works a person is diagnosed as ”brain death” and may then become an organ donor. Man is considered to no longer be in contact with the parts of the brain that is essential to human existence but considered dead. If this medical view on life would change, there might be a risk that the entire donor system will be re-evaluated. Given the chance that people can wake up and become fully restored, such a revaluation of the donor system is not at all impossible. Imagine if the person that the medical team declared brain dead the whole time being present through an independent mind, when doctors discussing procedures for the donation. With the possibility of the patient’s a miraculous return to the body it is reasonable to review the rules of donor procedure. Lydia Paillard woke up after being declared dead by doctors at Northern Polyclinic Bordeaux, France. The 60-year-old woman lost consciousness facing a chemotherapy treatment, and was declared by doctors to be ”absolutely clinically dead”. 14 hours later, she woke up, after her sons refused to allow the life support apparatus was turned off. The example is a strong evidence that consciousness is more than the brain. Excerpt: No Boundary, by Ken Wilber. Is the problem expectations or emotions?